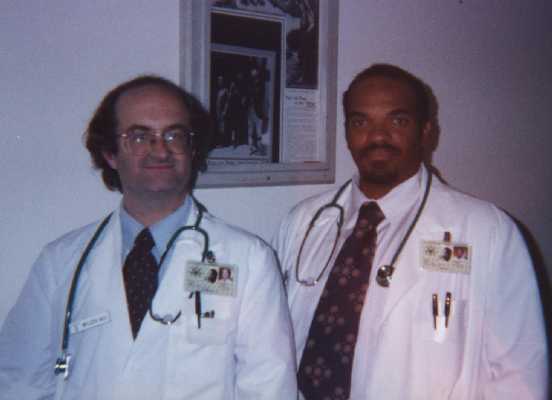 Between my being Taft-Hartley'd for the Frito-Lays/Star Wars commercial and prior to the SAG-Must-Join AmeriTech Cellular commercial, I was booked as the lead principal talent for the two comical [pre-SAG] commercials: Fox NHL Championship 2000 and Fox NBA Basketball 2000 home games (for PlayStation). The two spots were filmed at the Mack Sennett studios Friday September 17, 1999. I played the head scientist studying two sets of sports fans (hockey and basketball), isolated from Fox Television NHL games. One group had access to their respective Playstation game, the hockey control group was relegated to a sewing machine and floral print material, while the control group for the basketball group was consigned to arts and crafts (at one point they were shirtless, each with a letter on his chest, as occasional groups of fans would do at a televised game, in this case spelling out H E L P !). Wearing my own glasses and lab coat, I was provided with a lab photo ID card, which I was allowed to retain. Both/each of the spots are humourous enough that anyone seeing them most likely will remember having seen them. They started airing around November 1st (1999), albeit mostly on Fox Sport Net, their web site on which at the time they promoted both games. I was told they "could" be airing during the Fox Sport Net half-hour show The Last Word, but after taping numerous editions of the program, I never did see either of the spots there. I was also told they could air during college basketball games. I did receive a complimentary VHS video of the commercial spots from the ad agency. They shifted the focus from being a withdrawl study to being Just The Study Groups playing the game/s; the two sets of Control Groups were completed omitted from the completed spots. As it was they made two versions of the hockey one so that in one of them the game graphics would reflect the team "the Kings." At the time, local friends reported seeing the spots enough to remember telling me that they've seen it. I was informed by a fellow actor that it would air on ESPN "all the time." The following week he told me that when he attended a Lakers game, the spots were shown on the Staples Center Arena JumboVision telecast system. During intervening years I have seen no trace of the spot online, and the VHS tape I received malfunctions and I do not know if it can be repaired. If it can be repaired I can (and will), have the spots transferred onto a DVD.